Apple might have improved folders in iOS 7 (even unintentionally, in one instance), but there’s still a way to go until iOS app folders become truly functional. One new jailbreak tweak called BetterFolders aims to improve how application folders work through adding three new features; it’s available free of charge in the Cydia Store, and is optimized for the iPhone, iPad, and iPod touch. First, once you’ve downloaded and installed BetterFolders, you’ll find that it’s possible to easily add nested folders (that is, a folder inside a folder) using “wiggly mode.” The process is as simple as picking up one folder and dropping it on another; the second folder will be added to the first, providing iDevice users with an easy way of getting their Home screen in proper order. Next, BetterFolders enables a pinch-to-zoom gesture for folders. 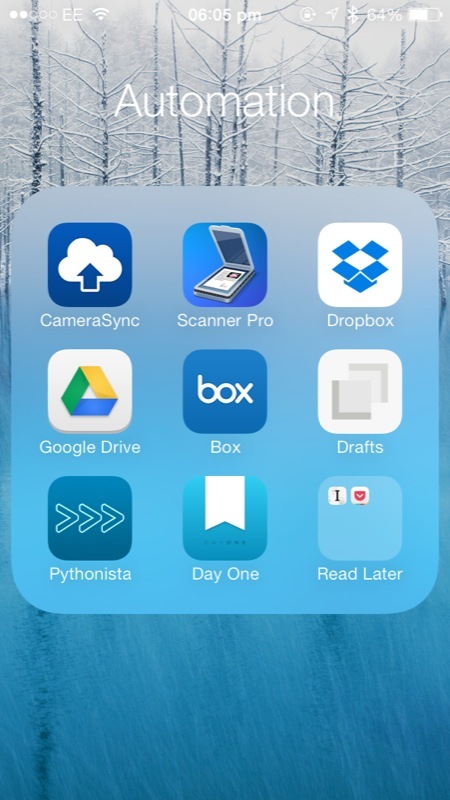 With the jailbreak tweak activated, users can pinch at their iDevice’s screen in order to close an iOS app folder. Given how universal Apple’s pinch-to-zoom gesture is across its mobile OS, built-in apps, and even third-party applications, it’s surprising this isn’t a feature the Cupertino, Calif. company added in iOS 7. Finally, jailbreakers running a jailbroken iPad will find that with BetterFolder installed, they’re able to have iOS apps display a total of 16 applications on a single folder screen (at four by four). This, too, is another change we wish Apple would make to its iOS, since the additional screen real estate offered by the 9.7-inch iPad and the iPad mini allows for this kind of folder interface. Until Apple does make the change itself, BetterFolders can help. As mentioned, BetterFolders can be downloaded in the Cydia Store free of charge, and it’s optimized for the iPhone, iPad, and iPod touch. For another useful iOS 7-compatible folder-enhancing jailbreak tweak, we’d recommend our readers check out Infinifolders. More recent impressive packages include ClipShot, Pebble Profiles, and HueHueHue. Do you have a favorite iOS 7 jailbreak tweak? See also: Photo And Video Management App Loom Gains New Sharing And Saving Features, T-Mobile Begins Offering Payment Cards, and On “1984” Anniversary, Apple Debuts Shortened Versions Of “Your Verse” iPad Air TV Ad.